2 year recall on first Endovac re-treatment case. Tooth #20 presented with previous RCT and persisting Symptomatic Apical Periodontitis. 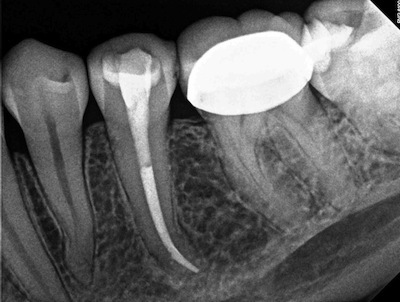 The periapical radiolucency is bi-lobed, suggesting two portals of exit. It is important to locate and clean complex anatomy in order to heal the disease. The location of the “lobes” of the lesion give the location of the anatomy away, as the POEs tend to be centered in each lesion. 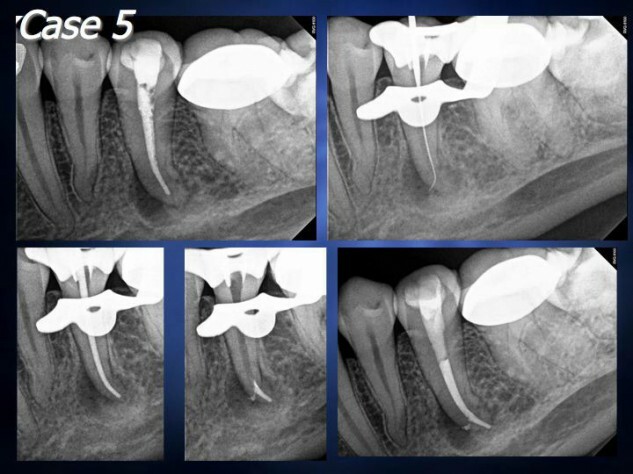 I almost always complete re-treatment cases in multiple visits, to utilize calcium hydroxide as an inter-appointment medicament. There have been a few recent studies suggesting a good efficacy of negative pressure irrigation (the Endovac) in aiding canal cleanliness, even in one visit. This was my fist case using the Endovac in a one-step re-treatment. The shape was finished at 40-08, which is bigger than I would shape it to today. After debriding the accessory canal and flowing high volumes of irritant to the apex, the two year recall shows an excellent result with complete regeneration of the periapical tissue. Two year recall: “Strindberg” success. Dear Dr. Dan and Ruthie; I thank you, not only for your professional expertise and abilities, but also for the caring concern that you extended towards me. It turned what could have been a trying anxious time into a time of pleasant healing and nurturing. Thank you both. Dan, Thank you so much for taking such great care of me! I’m super grateful for your generosity and my tooth feels great! Thank you Dr. Boehne and the team. I was treated with professionalism and I was well informed during the entire process. A truly fantastic experience! Dear Dr. Boehne, I want to thank you for the skilled and compassionate services you rendered to me with regard to my root canal. I was greatly impressed by your professional skills and your sensitivity to your patients’ concerns and fears. The kindness of all of your staff and the state-of-the-art equipment in your office, are also eloquent manifestations of your commitment to the best possible care of your patients. I am profoundly grateful that Dr. Franke sent me to you.